Silver Lake State Park is a 3,000 acre park along four miles of Lake Michigan shoreline. Unique to this park is the 450-acre parcel designated for off-road vehicles, and the access to both Silver Lake and Lake Michigan are an added benefit. The 107' Little Sable Point Lighthouse is located in the Silver Lake State Park, and it is open for tours from late May to late September. Rolling sand dunes, camping, hiking, fishing, and acres of forest make this park a vacation paradise. Benona Township Park, also known as Stony Lake Oval, is an excellent spot for families to swim or fish. This is where the Stony Lake channel joins Lake Michigan. 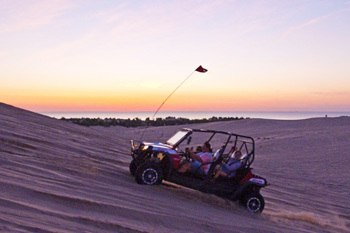 Cedar Point County Park is located between Silver Lake Sand Dunes and Pentwater off B-15. The highlight of this park is the multi-tiered steps that offer a spectacular view from the high bank. Follow the steps to the beach for great swimming, a picnic area, and restrooms. Gale's Pond County Park is a must-see for nature lovers. Wildlife and a variety of birds are in abundance as you walk the marked trails among the woods. Picnic tables, bridges, and boardwalks are unique features of this park, located at Fillmore and 112th Avenue, five miles southeast of Hart. Hart Area Veterans Memorial County Park is right on Hart Lake. In honor of veterans everywhere, three flags fly year-round--the American flag, Michigan flag, and the POW flag. A large, handicap accessible boardwalk, a monument to fallen veterans, and a jet from the Korean War make this an interesting and beautiful park. 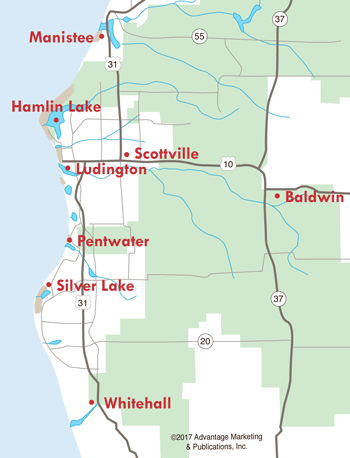 Golden Township Park is located off Silver Lake Road, just north of Little Sable Point Lighthouse. Parking here is limited and facilities include portable restrooms.